August | 2010 | Happy nom nom nom-ing! It seems that Asians like making edible things in a spherical shape: beef balls, fish balls, daifuku, dango, dumplings. Maybe the shape of the food represents the simplicity and the back-to-basic roots of Asian cuisine. I was having a discussion with the boyfriend the other day and we were talking about the difference between Asian food and non-Asian food. Asian food seems to be more focused on the natural flavours of a dish. Albeit, we do use a lot of sauces and different seasonings, but we find the right balance between each to create an intricate dish. Even then, the dish can still taste very natural like there hasn’t been much added to the main ingredient. I don’t think Asians could ever make a show like 4 Ingredients. The sauces alone would take up about 3 of the ingredients. While I do occasionally enjoy a steak, it makes you think how simple it can be. A piece of meat, some salt and some pepper. Now I’m going completely off track. So going back to spherical shaped food, on Saturday, the boyfriend, my eldest ‘daughter’ and I went to a Takoyaki demonstration at Chef’s Armoury. I have loved Takoyaki since my high school years. It’s cheap, warm, tasty and so easy to get your hands onto. When Chatswood has their Thursday markets, there is always a Takoyaki stall (Colotako). They also have a stall at the night markets in Chinatown. 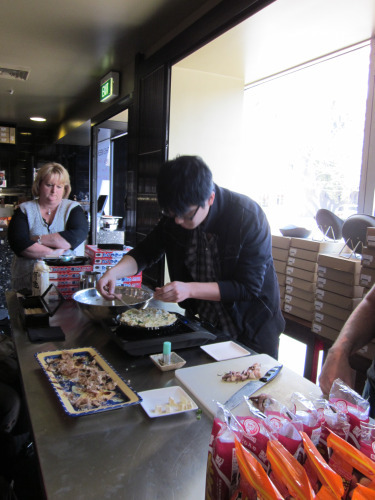 Watching rows and rows of Takoyaki being made and dished out to the crowd of Takoyaki-lovers. They are a great street food that comes out piping hot and has led to many burnt tongues over the years. I was excited heading to a Takoyaki demonstration and though it would be some basic ‘you sit there and watch me’ demonstration. But Leigh was very nice and allowed the boyfriend to do some hands on cooking. Now the boyfriend wants to buy a Takoyaki pan so that we can have a Takoyaki party. 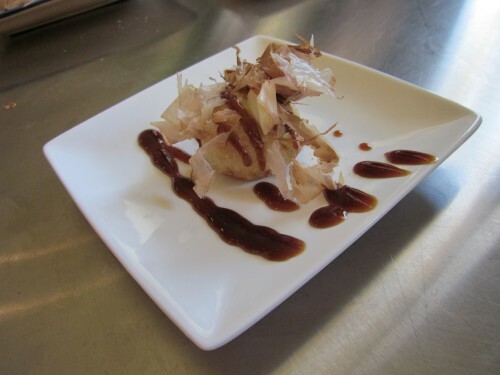 Thanks to Chef’s Armoury, I have a Takoyaki recipe to share with everyone. 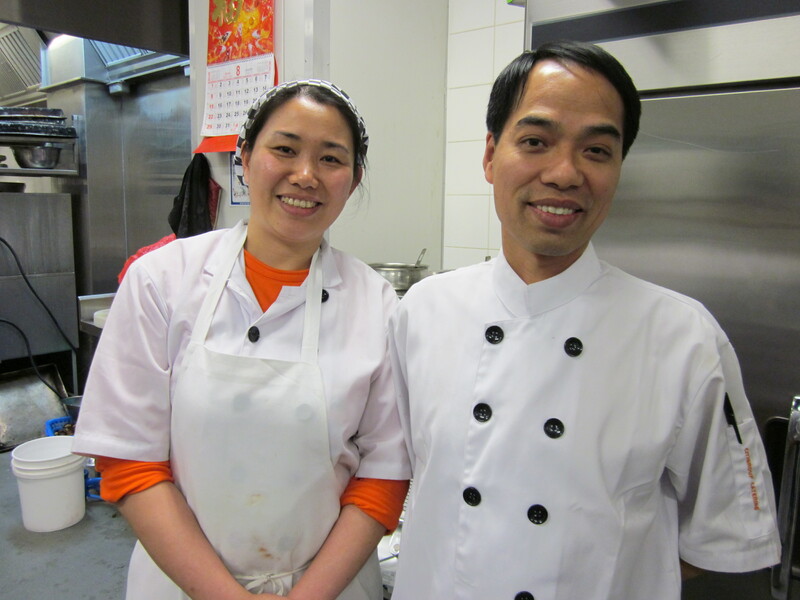 Thank you Eddie and Leigh for your wonderful demonstration! L – R: Shallots, Cabbage and Bonito Flakes. L – R: Bulldog Osaka Takoyaki Sauce, Shimaya Katsuo Dashi, Nissin Takoyaki Flour and Kenko Offu Mayonnaise. Double sift flour into bowl. Add kuzu, eggs, soy sauce and mix. Slowly add the stock and whisk well until the mixture is smooth. It should have the consistency of thin cream. Add shallots and cabbage, mix and let the batter rest for an hour in the fridge. You can use the batter straight away but a rested batter produces better results. Heat the pan on high and oil well with rice bran or vegetable oil. 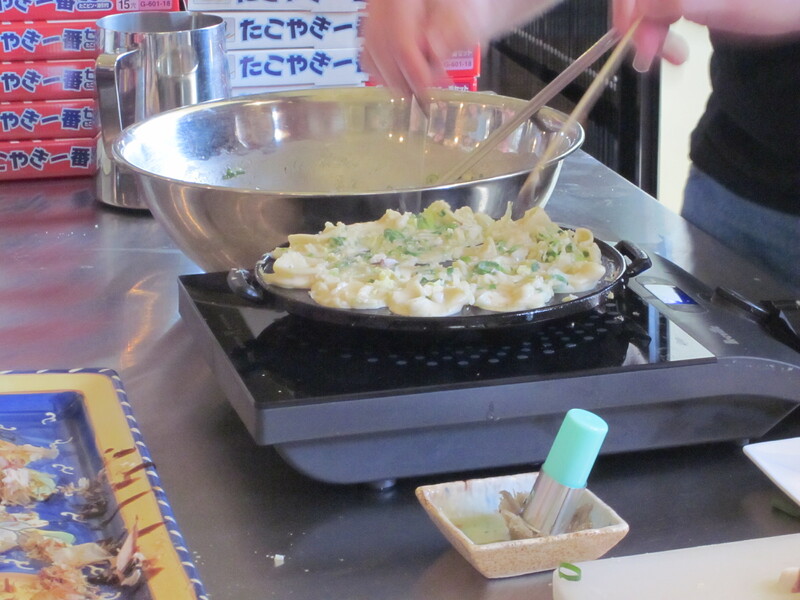 Mix the batter and pour into the Takoyaki pan half way up each Takoyaki mould. Add a piece of octopus in each of the moulds and cover with more batter until overflowing. When the batter starts to set a little, scrape the excess with a skewer back into each ball. Spin with a turning spike with the uncooked side down. Keep turning until the balls are formed and are a nice crisp down all the way around. Serve with a splash of Takoyaki sauce, Japanese mayonnaise and some bonito flakes. The boyfriend’s taste at Takoyaki making, now he wants to buy a pan. 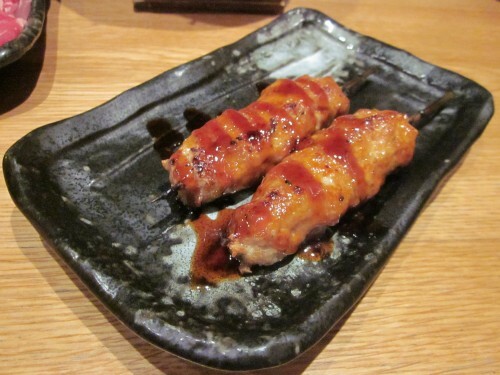 Traditionally Takoyaki are filled with octopus, but they can be substituted with other ingredients. Try a sweet version by adding some matcha and substituting the savoury ingredients with sugar syrup, place some pieces of mochi or m ‘n’ ms inside to create a delicious dessert. This sounds interesting and if I buy a pan I will try and make both sweet and savoury *insert ingredient*-yaki. 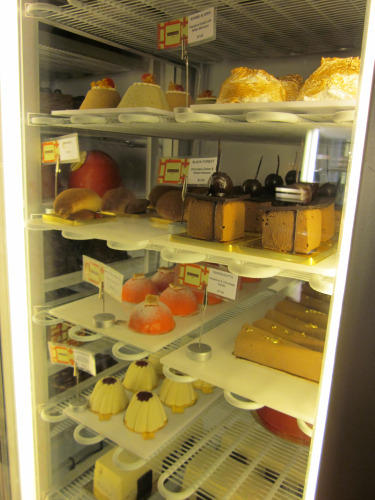 When I visited this gelato shop I knew I’d be back again. I just didn’t realise it would be so soon. My family and I had some dessert there last Thursday night, then I went again with the boyfriend and the kids on Friday night. 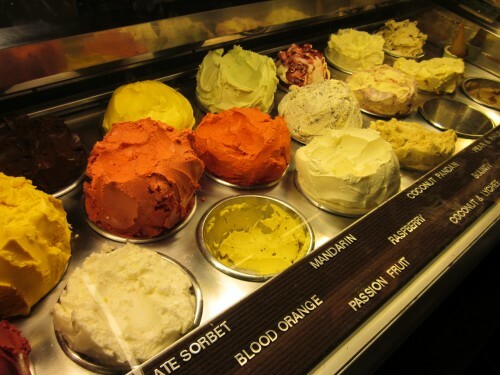 This place is arguably one of the best gelato shops in Sydney. 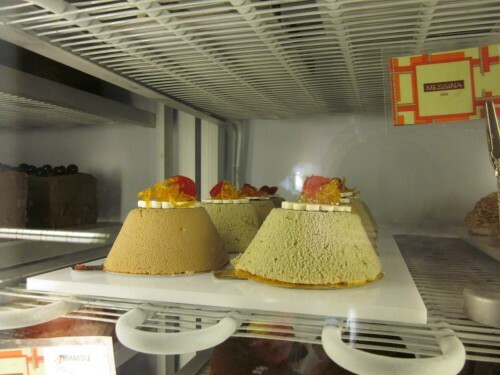 Not only do they sell gelato, but they have a wide range of gelato cakes are look so tempting. 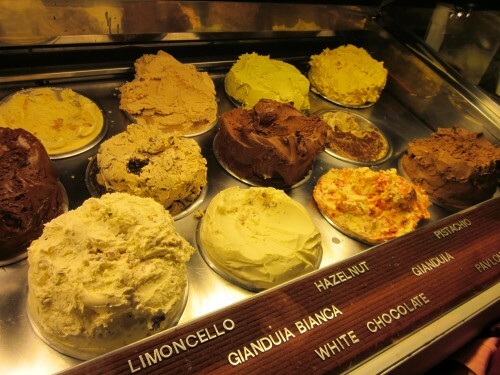 Their gelato is made fresh on the premises daily and they offer a range of 40 flavour. These flavours range from the weird: Satay (which tastes like salty peanut butter), to the wonderful: Pavlova (this is absolutely delicious with pieces of crushed meringue, passionfruit and I think raspberry). So many choices, so many delicious flavours. I felt like I was a kid in a candy gelato shop. 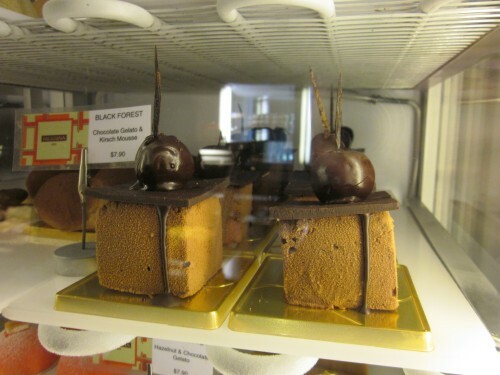 This Black Forest reminds me of Heston Blumenthal’s version of his perfect Black Forest. The full cake looks even more like Blumenthal’s Black Forest cake as they both look like bricks. Look at the beautiful mounds of gelato. My scoop was Saffron with Pistachio Praline wasn’t very tasty. The truth is, it tasted like I was eating plastic. Although after a couple of bites, it tasted a lot better. There were little pieces of the Pistachio Praline with gave it a slightly crunch texture. I eventually got through my scoop and got used to the flavour. However, I won’t be ordering that flavour again. The boyfriend got Fig in Masala. He found it slightly too sweet, otherwise he did find it quite nice. The kids (Clarissa and Rosanna) got Pavlova and Milk Chocolate Brownie, respectively. I had had Pavlova the night before and absolutely loved it. The Milk Chocolate Brownie was very lovely as well, there were chunks of brownie which added to the flavour. Why do kids choose the nicest flavours? This place is great for dessert. 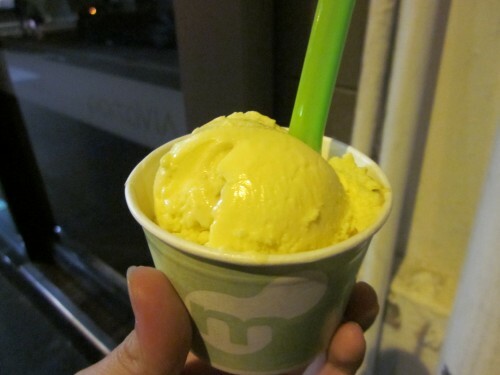 Although parking is hard it find, driving around until you find a spot is well worth it when you taste the gelato. Next time I’ll make sure to ask for a little taste test before buying an entire scoop. If you’re courageous and willing to experiment with different flavours, this place is for you. The staff are friendly and plentisome so there isn’t much waiting to be done. The shop is quite small, so unless you get a table, you have to go in, get your gelato and get out. But it doesn’t matter because the gelato doesn’t last very long. I love this place! The boyfriend visited here a couple of weeks ago with his friends and raved about this place. He finally decided to take me and the ‘kids’ (my 2 little cousins that we absolutely adore, we call them our daughters) there the other night. The restaurant was quite easy to find with heaps of street parking nearby. The restaurant is quite open and has views of the street outside. 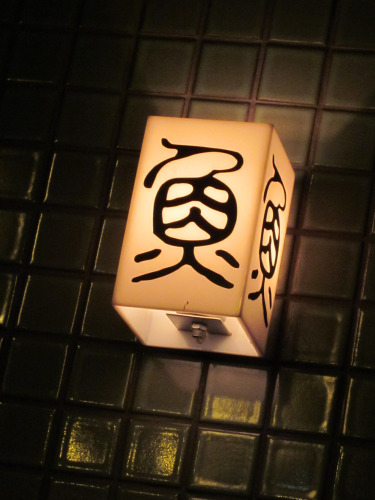 The ambiance is quite low key and relaxed, coupled with the friendly staff, it was quite a welcoming place. We were presented with a menu that kind of resembled an encyclopedia. The menu was big and was scattered with many tempting photos of their food items. Everything looked so good and I wanted to order so many things. Alas, there is only a limit to how much our stomaches can hold. Now onto the food. 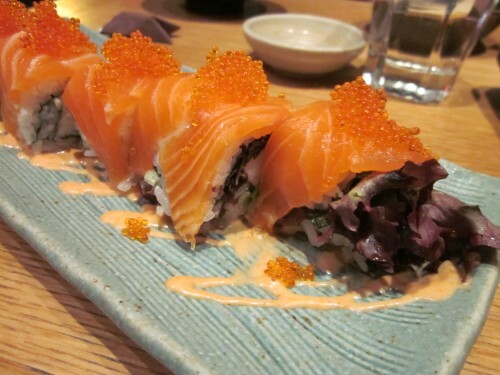 Dai Dai (Japanese for ‘orange’) roll plays on the usual way sushi is prepared. Fresh salmon envelopes a combination of seaweed, fragrant sushi rice, crab stick and sweet, ripe mango, with twin colour sauces created using orange juice, chili and mayonnaise to lend piquant flavours to the dish. Very crispy on the outside and creamy on the inside. This was definitely a favourite with the kids. Although it’s deep fried, the oil has been well drained, there is no oily residue when eating it. The soup is very flavoursome and all the ingredients absorb the flavour. The pot was empty by the end of the night. The boyfriend had previously tried the Wagyu Sukiyaki, he found that the Wagyu was a lot more tender in comparison with the Beef, although both soups were quite delightful. A slight green tea flavour with a very refreshingly cold dipping sauce. The Soba was a very nice palate cleanser. Although slightly more pricey than most Unagi rice served in other restaurants, it was still quite delicious. 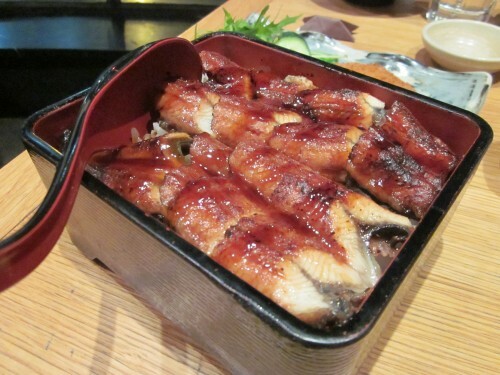 However, there was not much difference in flavour between this dish and other eel dishes served in other restaurants. This reminded me of eating Japanese Hamburg, just on a skewer. The flavours went well together and there was a slight crunch from the onions in the mixture. When the waiter brought it to the table, I didn’t think it was ours. The picture in the menu looked completely different to what was being served. But I was willing to forgive due to the taste of the dish. The meal was quite satisfactory. There was more than enough for 2 adults and 2 kids. 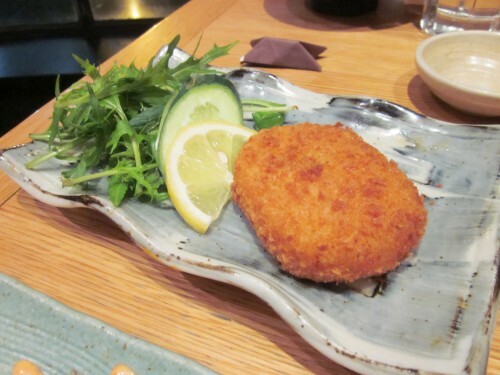 The kids loved the potato croquette and the eel rice. Sushi Tei also has a lovely selection of sushi and sashimi, but I wanted to try the hot food items more. I think this restaurant will be a new favourite of mine which I will frequent more when I’m in the area. 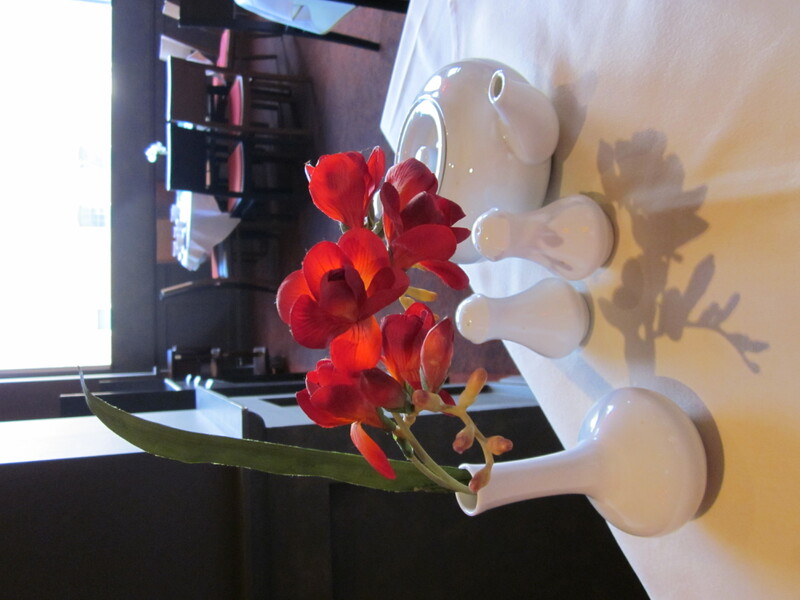 The staff are friendly, the location is good, the prices are reasonably. Go try this restaurant when you’re in the area. Last week I attended the opening ceremony (sounds like the Olympics, doesn’t it?) 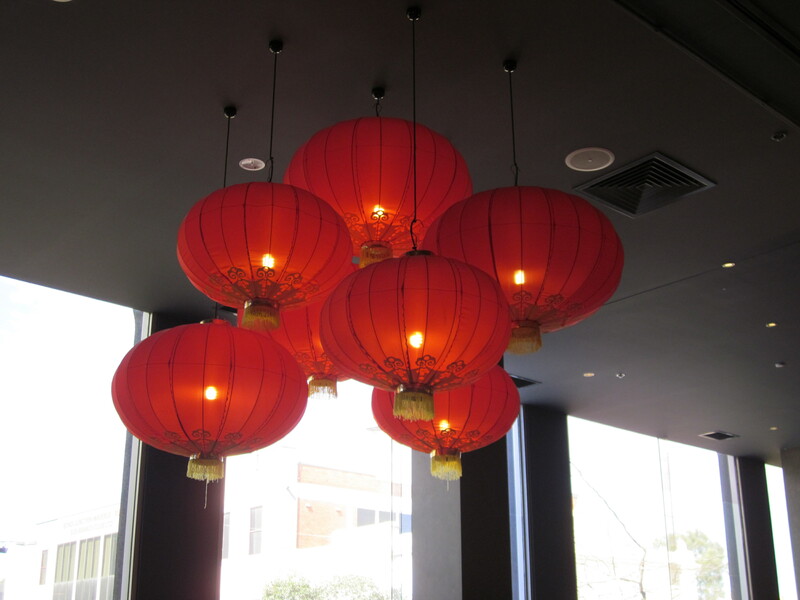 of a new chinese restaurant in Bondi Junction. My dad is friends with the boss, the manager, as well as the head dim sum chef there. The opening was quite successful, it had the local MP, the board of directors, dancing lions, the whole shebang. I didn’t take any photos because I didn’t really know anyone there (only my dad’s cheffy friends) and I was bored. Today my dad woke me up and told me we were going to go yum cha. 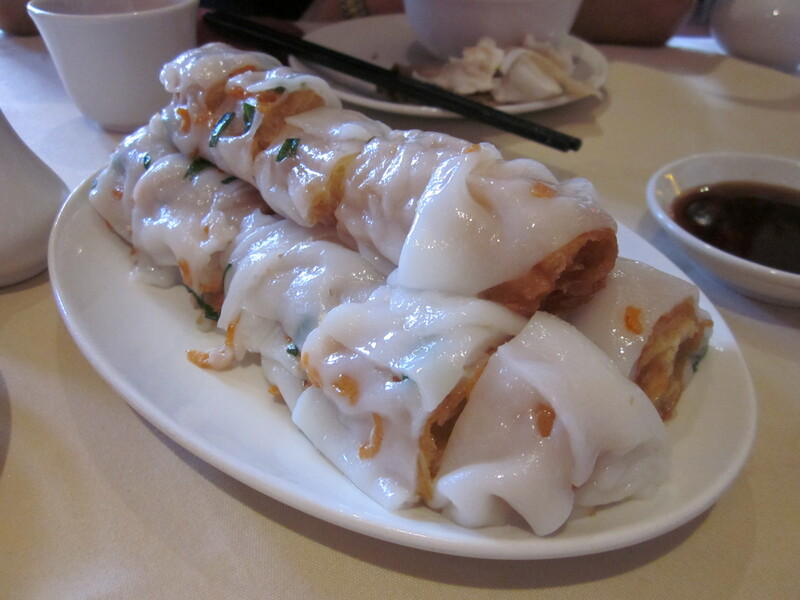 While I am a fan of yum cha, I have grown to despise many yum cha restaurants around where I live. So every so often, I drive all the way to Parramatta (I live on the North Shore) and I have yum cha at The Prince in Parramatta. Main reason why I go there: my dad works there and I guess my taste buds have grown to only like the dim sum he prepares. But on days where my dad doesn’t have to work, he takes me around to his friend’s restaurants, having yum cha and testing out their flavours. Today was no different. We met up with his friend Peter Gor (he used to be the boss of Kam Fook in Hurstville and most recently New China Restaurant in Haymarket) to try out this new restaurant. This reminds me of those olden day China shop signs. 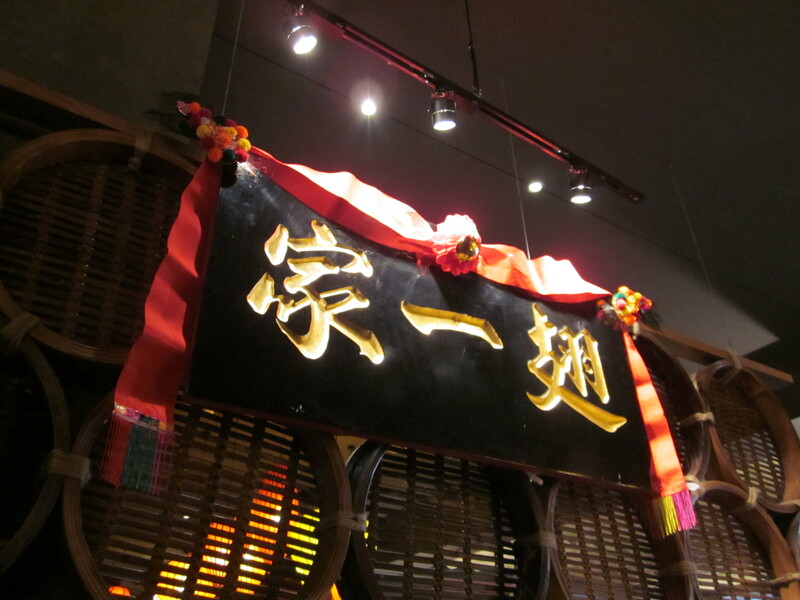 I was met with the restaurant manager William Wong (黃明) who is my dad’s friend, who I had also met last Thursday. He didn’t recognise me, which I kind of like (I don’t like those people who ‘shine shoes’ 擦鞋 when they know who my father is). He was very polite though when he realised who I was but I didn’t mind. We were shown to a nice table where my dad was greeted by his friends. I whipped out the camera and was in my own little world of photography. The interior is quite nice. The theme is very Chinese and Asian, but with a slight modern twist to it. 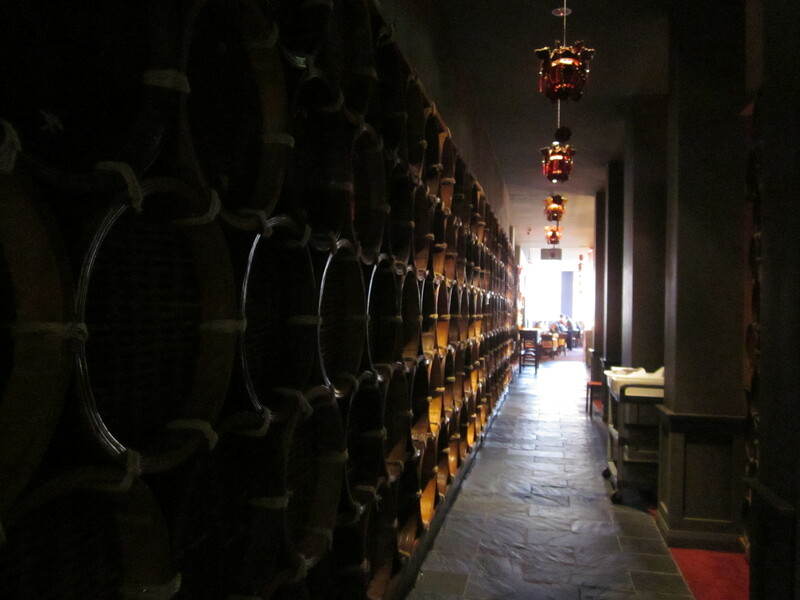 Along one wall is a row of windows, this helps with the lighting of the restaurant. However, as the ceilings are quite low, there is a certain dimness to it. But I’m all for natural light since it does help the environment, so bravo to them. I love this part of their ceiling. 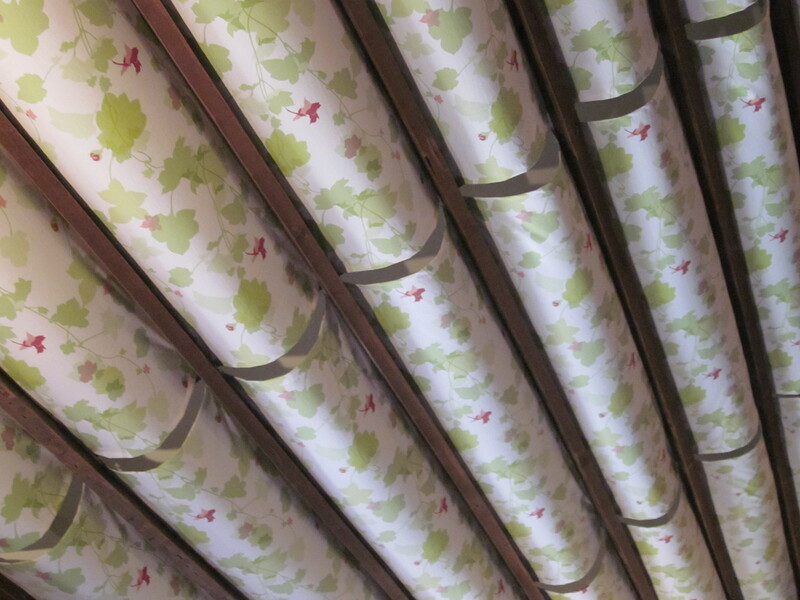 It looks like rolls of fabric hanging from the ceiling. The lanterns are also very authentic with a clutter of modern placement. Very clean and simple table decorations and cruets. A wall of giant bamboo steamers. An open-faced dumpling stuffed with ground pork, chopped prawns and mushrooms in a wonton wrapper. 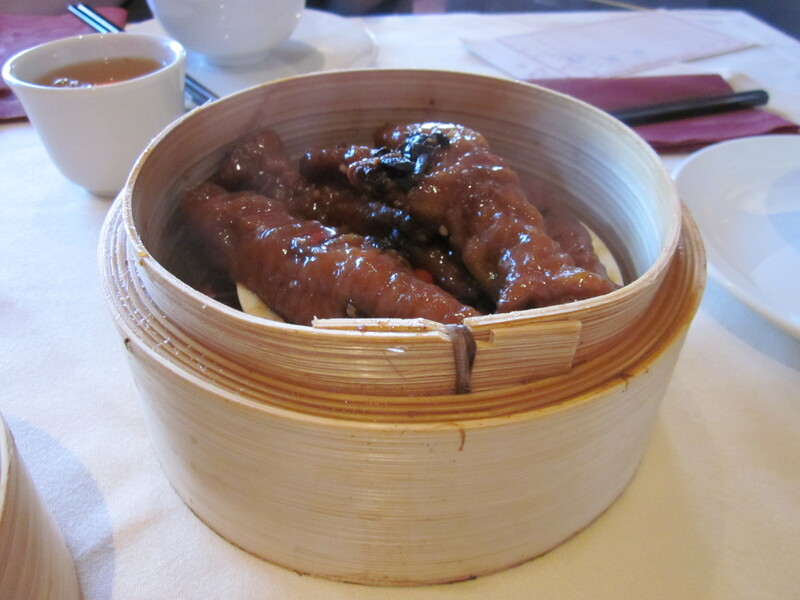 Chicken feet simmered in black bean sauce. A mixture of peanuts, garlic chives, ground pork, dried shrimp, dried radish and mushrooms wrapped in a chewy dumpling wrapper. A mixture of garlic chives and chopped prawns wrapped in a chewy dumpling wrapper. 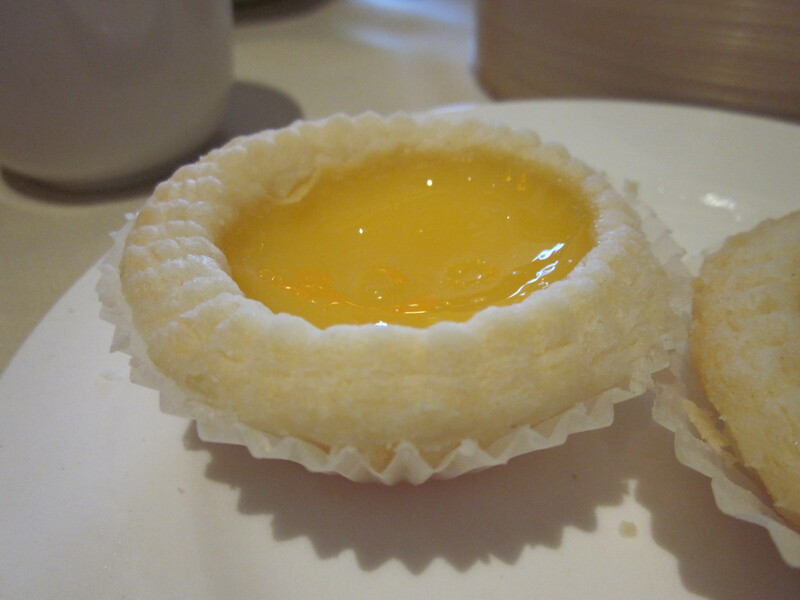 Egg custard baked in a flaky pastry cup. 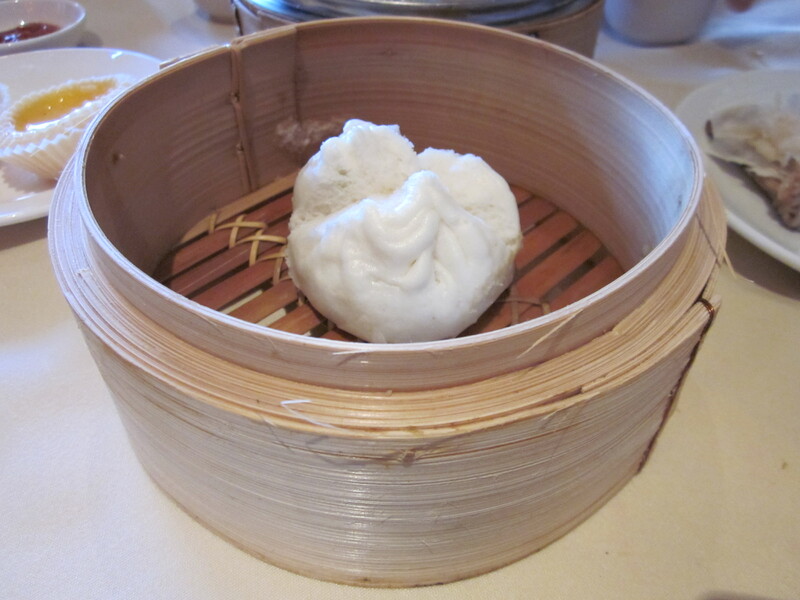 Steamed bun filled with minced chicken and ginger. Chinese donut wrapped in a rice paper roll. My dad ordered the Chicken Bun (雞包) when I had gone to the bathroom and when I came back there was only 1 left in the steamer. That’s why the bun looks so lonely. 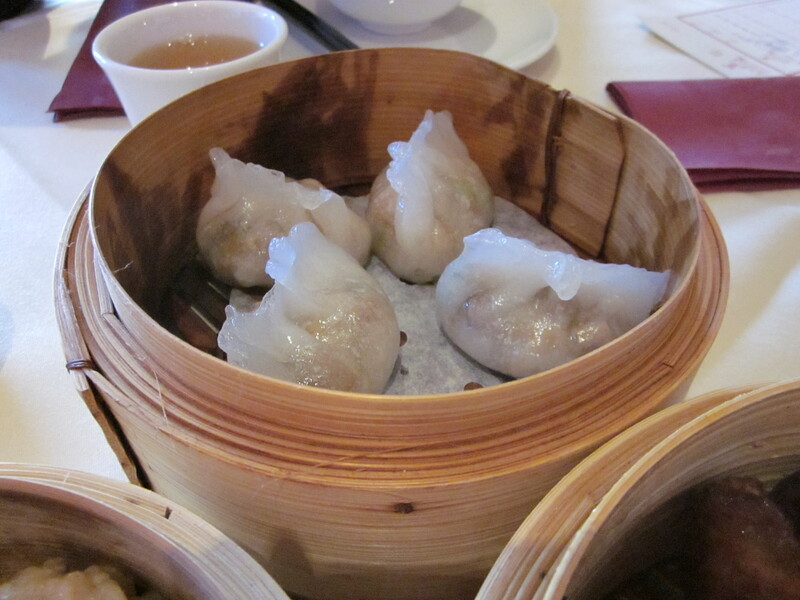 My favourite dim sum lately has been the Chiu Chow Dumplings (潮州粉果). Although I do admit I only really like the peanuts that are usually present in the dumpling. 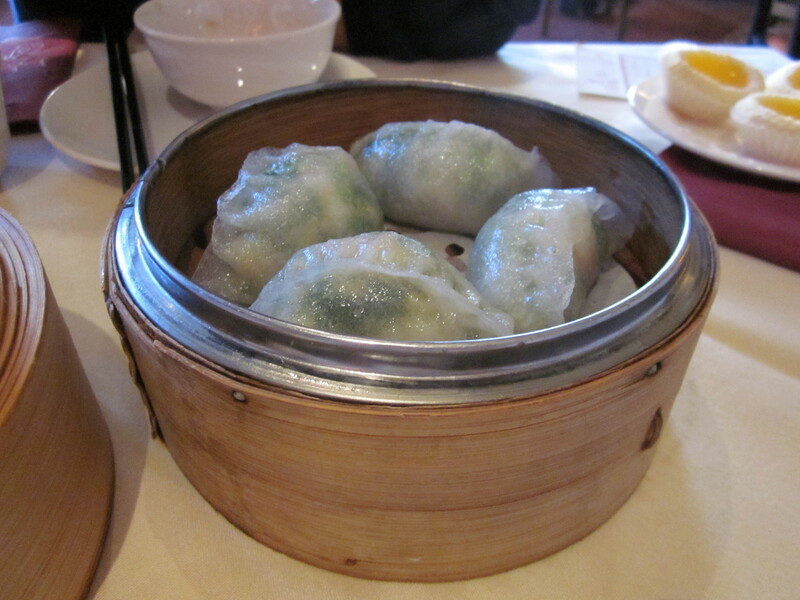 Therefore I was slightly disappointed when I bit into the dumpling and there were no peanuts. Turns out that there are a lot of people allergic to peanuts, therefore they replaced the peanuts with pinenuts. I do, however, commend them on their chewy dumpling wrapper. It was thick, but not too thick, and it was quite chewy (which I like). Many yum cha places have not perfected the art of wrapper making and they come out with dumplings that just break apart on touch. 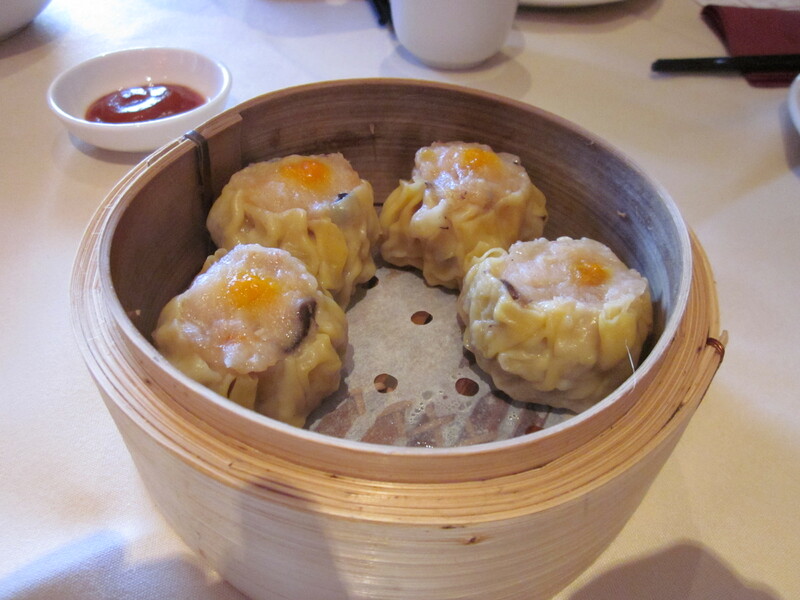 For every 3 dim sum dishes you order, you get the 4th for free. 10% off the total bill. It’s a pretty good deal and their dishes are reasonably priced. The only problem is the parking. Closest parking is in Westfield Bondi Junction and that only has 2 hours of free parking (Can people really go shopping in only 2 hours?). Alternatively you can catch a train, the train station is a couple minutes walk away. There’s also another shopping centre nearby which offers parking but I don’t know the name of it. Personally I would rather still drive to Parramatta to go have yum cha, but if you live near Bondi, why not try this place? Ichigo Daifuku are small round ball of Mochi (glutinous rice), that is wrapped around a filling of Ichigo (strawberry) covered with Anko (smooth red bean paste). 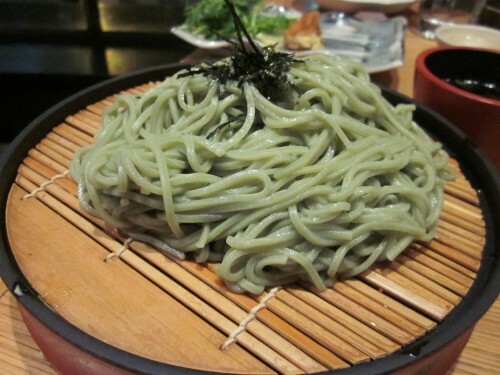 It is then rolled in Katakuri starch (potato starch) to keep it from sticking to everything. They are absolutely delicious. Chewy on the outside and when you bite it, there is the sweetness from the Anko and a burst of juice from the strawberry. Everything balances out and it’s like a party in my mouth. I love anything that is sweet and chewy so I absolutely loved these when I tried them at a recent Chef’s Armoury event. There’s another one happening on 11 September at 1pm if people are interested. 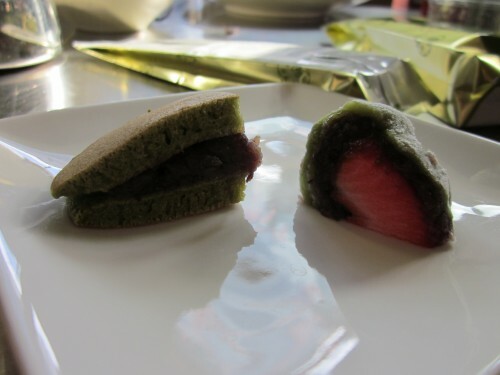 Thanks to Chef’s Armoury, I have a recipe for Ichigo (Strawberry) Daifuku to share with everyone. Enjoy! Wrap a layer of red bean paste around the strawberry to create a ball. Dust the bottom of a tray with potato starch and set aside. Combine sugar and shiratamako in a rice cooker. Slowly add water and mix with a silicon spatula until you have a smooth paste. 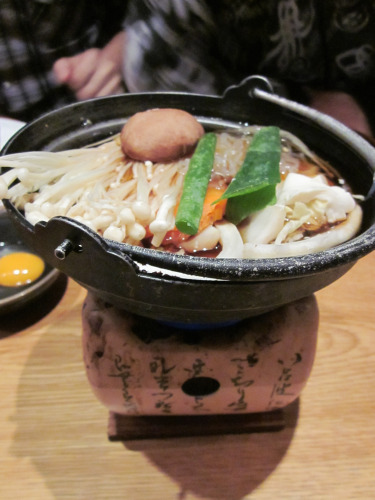 Cook in a rice cooker on ‘steam’ mode for about 15 – 20 minutes. Stir with a spatula dipped in water until smooth and turn out onto the tray with potato starch. 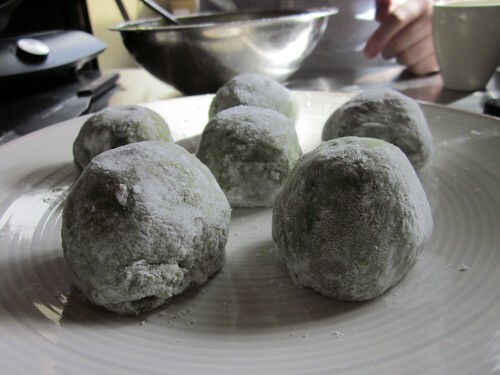 Dust your hands and prepared mochi with potato starch. Let the mochi cool for a couple of minutes until touchable and divide into 6 balls. Press balls into disks and stretch each one around the strawberry/anko balls. Twist the bottom to seal in the strawberry and shape the ball. A whole plate of Ichigo Daifuku. Yum! Tip: Do not put them into the refrigerator, otherwise they will go hard and will not be chewy. 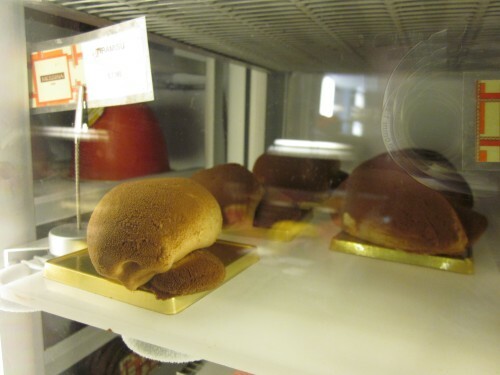 Dorayaki are two small round pancakes sandwiched around Azuki bean paste. They take their name from the Japanese word for gong. Dorayaki are probably most commonly known by Asians through the famous anime and manga character, Doraemon. Doraemon is a cat-shaped robot from the future who has a famous four-dimensional pocket filled with useful gadgets. Doraemon absolutely loves Dorayaki. I have previously tried packaged Dorayaki from Asian supermarkets. 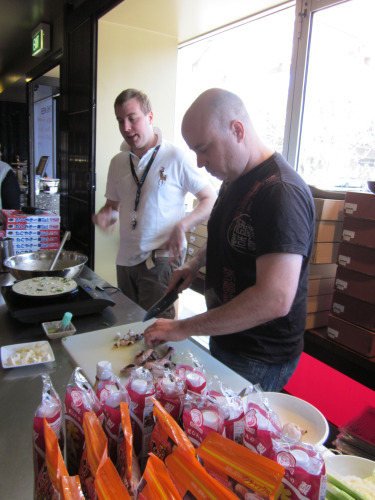 However, after tasting them at a recent Chef’s Armoury event, I can say that they ,obviously, taste better fresh. 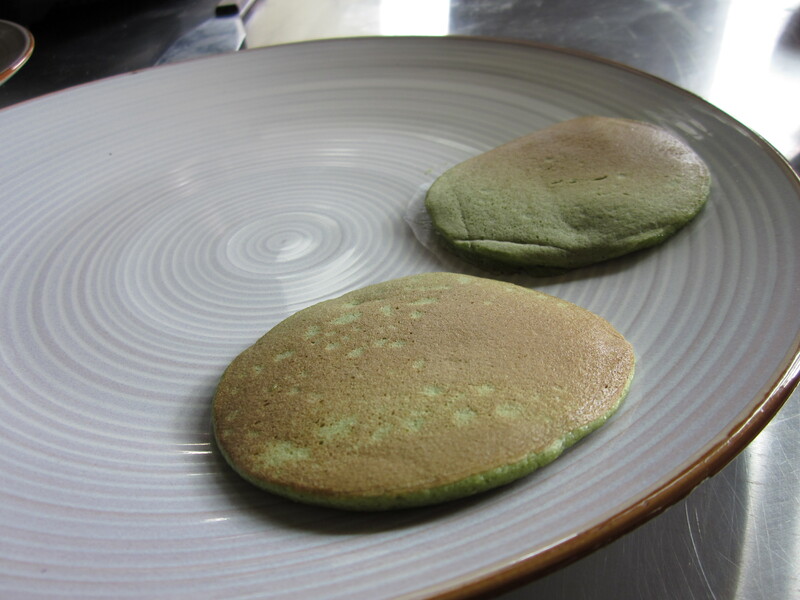 Thanks to Chef’s Armoury, I have a recipe for Matcha (green tea) Dorayaki to share with everyone. Enjoy! Combine the water, baking powder and syrup. Make sure the syrup has dissolved into the water and cool. Whisk eggs and sugar until you have soft peaks. Sift the flour and matcha powder three time. 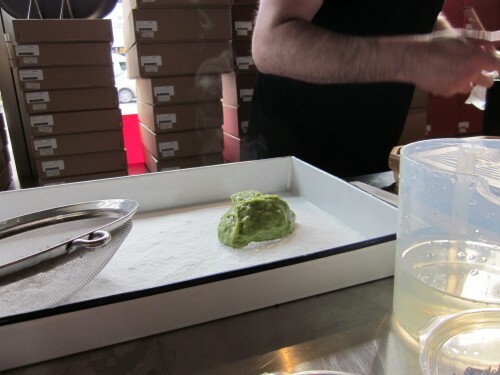 This ensures that there are no lumps in both the flour and the matcha powder. Slowly add the sifted flour into the egg mix while whisking, followed by the liquids. Mix well and set aside for approximately 20 minutes. After 20 minutes, the consistency should be slightly thickened. 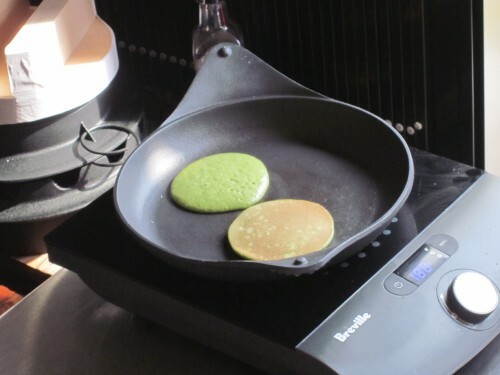 Adjust with a little bit of water to get a pancake mixture consistency. Cook the mixture in a pan over medium heat (180°C) until bubbles appear on the surface. Make sure they are all approximately the same size. Flip the pancakes over when the bottom is nicely browned. When the other side is nicely browned as well, they are ready to be taken off the heat. 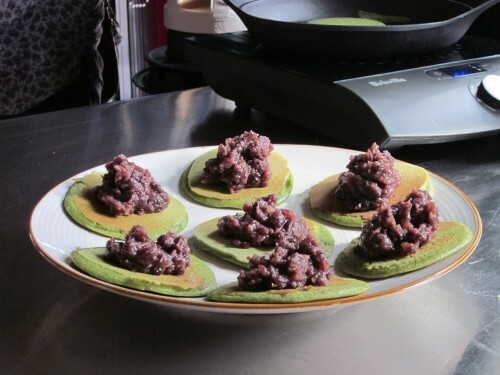 Serve two pancakes sandwiched together the prepared red bean. My dear future ‘sister-in-law’ made breakfast this morning. We had home-made ‘baked beans’, pan fried mushrooms, poached eggs, salad and Brasserie bread. I have always loved poached eggs, Eggs Benedict is my absolute favourite brunch menu item. It got me into thinking about eggs. I’ve decided to give everyone a basic crash course about eggs. Eggs are a good source of vitamins and minerals. They can be served alone, prepared in many ways, or used as an ingredient in other meals. From watching the Lifestyle Food channel on Foxtel, I have noticed that in America they have white eggs. However, I found out there is no relationship between the colour of the eggshell (brown – Australia, white – America) and the quality or taste of the egg. So don’t worry if your carton of egg is different shades of brown. Use eggs as soon as possible after purchasing. Flavour and appearance deteriorate with age. I usually try and find the carton that has the use by date furthest from the day of purchase. Boiling causes eggs to become rubbery. When cooking eggs in the shell, place the eggs in water (some dispute that this should be boiling water, some say cold water). I use cold water and cover the egg/s by 1cm. Bring to the boil, then turn down the heat to a simmering temperature. Soft-boiled eggs should be cooked for no longer than one to three minutes. Hard-cooked eggs should be cooked no more than 15 minutes. However, it does really depend on your stovetop. I cook my eggs for about 7 minutes at a low simmering heat. It also depends on how big your egg is. Experiment a bit and write down: 1) How big your egg is. 2) How long it takes to cook to your liking. 3) Which stovetop you used and on which setting. After removing eggs cooked in the shell from the water, immerse them in cold water and peel them immediately to prevent yolk from turning green. To poach eggs, bring water to a simmer and add some vinegar before adding the eggs. Eggs should be broken into a separate dish before they are added to the poaching liquid. The poaching liquid should be spinning before you place the egg into the liquid so that the white coats the yolk and hopefully you end up with a nice little ball of poached egg. This method needs only a minute or two in the simmering water for the egg to be ready. The yolks will be thick but with a runny consistency. Once again, poaching does depend on the egg and the heat of the water. So if you make it quite often, write down some information to creating your own perfect poached egg. Cooking Uses: There are many different ways to use eggs in cooking. When eggs are heated, the protein in the yolk coagulates. 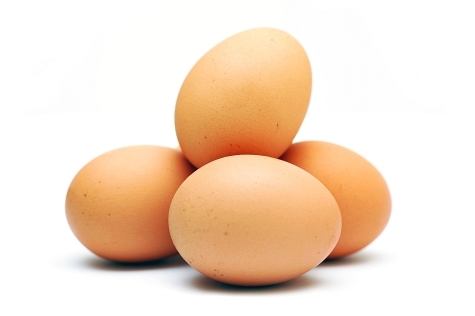 This makes eggs useful as thickening agents and for coating other foods. When heat is applied to the egg white, it changes from a transparent to a soft white colour. When sugar is added to an egg mixture, higher heat is needed for coagulation. When salt is added, a lower temperature is needed. When an acid such as lemon juice is added, the temperature for coagulation is also lowered and a fine gel is produced. Binding and Coating: Eggs help make ingredients stick together in products such as hamburgers and in batters for deep-fried products. Leavening Agent: Leavening involved incorporating gases into a product to increase the product’s volume and make it lighter. Beaten egg whites create a foam made up of air bubbles surrounded by thin layers of egg white film. When this foam is incorporated into a mixture and heated, the air bubbles expand and the film hardens. This process occurs in making souffles and sponge cakes. Egg whites should be beaten only until the peaks stand straight. If they are over-beaten, the volume of the foam will be reduced. 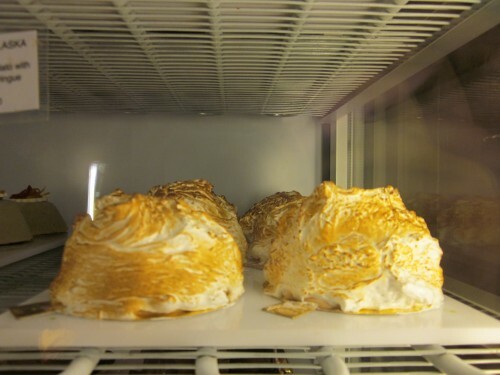 If sugar is added to egg whites while beaten, the resulting foam will be more stable, when baked this will become a meringue. Egg yolks can also be used as a leavening agent: when heated, they increase in size. However, because of the presence of fat, yolks are less effective leavening agents than egg whites. Emulsifying Agent: Oil and vinegar separate unless the oil droplets are coated with egg or some other emulsifier to prevent the separation. Egg yolks are used as an emulsifier in mayonnaise, ice cream, and my favourite Hollandaise sauce. Interfacing Substance: Eggs prevent ice crystals from combining to create a larger mass. They are used in this way when sherbets are made. Clarifying Agent: When egg protein coagulates, it traps particles in the substance so they can be removed. This makes liquids clear and free from impurities. Broths can be clarified with egg whites. All this is just basic information for eggs. Of course there are other ways of cooking eggs: frying, scrambled, omelette. Hopefully this opens your minds to many other different ways eggs can be used and creates a better understanding to how such a ball of protein can have so many uses. There are also many different eggs: chicken, hen, duck, ostrich, goose, quail and many more. One of my favourites is thousand-year-old egg, it’s very nice in congee. Don’t be scared and have a try of different types of egg.